Every student has the opportunity to get a Golden Eagle Debit Card, which is similar to a regular debit card, but it’s connected to a student’s account at the College of Eastern Utah instead of a personal checking account and it has no effect on a credit score. If a student receives financial aid, scholarship funds, refunds, or payroll from CEU, they can have it put on their debit card. Parents, employers or anyone else the student allows can also add money to the card from their bank accounts securely. This is not a credit card. The school is not lending money to the student/cardholder, it will not allow the cardholder to spend more than their balance, and it will never convert to a credit card. It has the Visa logo, so it can be used anywhere that Visa is accepted. This means that it can be used at any merchant, anywhere and the purchase/payment is deducted from their card balance. There is no monthly service charge, no minimum balance fee, no regular support fees, no electronic statement fee, no web access to balance fee, no fund transfer from card fee, no card holder research fee, and no on-campus ATM withdrawal fee. There are fees that a cardholder needs to know about. If the cardholder has an after-hours (after 5 p.m. PST), non-emergency live support call, it is $3 for the call. It is $15 if the cardholder needs a replacement card for any reason. The cardholder receives one free off-campus withdrawal per month, but for every other off-campus ATM withdrawal, they are assessed a $1 fee. The cardholder can generate an online statement at any time without charge, but to receive paper statements, it is $3 per statement. If the bank holds the cardholder at fault in a dispute merchant transaction, a $25 fee is assessed. If the card is used outside the United States, then a $1 fee is assessed in addition to the one percent that is charged for international transaction. If the cardholder overdrafts, then a $25 fee is assessed. If the cardholder does not use the card for a continuous period of six months or longer, a $5 service charge will be deducted unless and until the balance is $0. The last fee that is charged is when someone puts money onto the card, it is $2 per incident. On the website and in several places around campus, there is guide that explains this process. 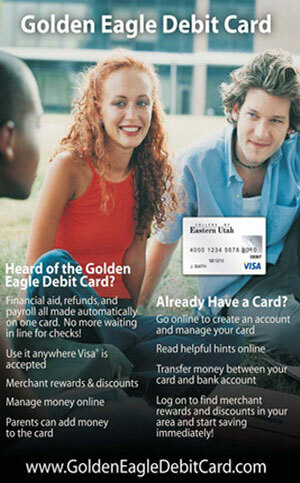 For any questions visit the web site, www.goldeneagledebitcard.com.